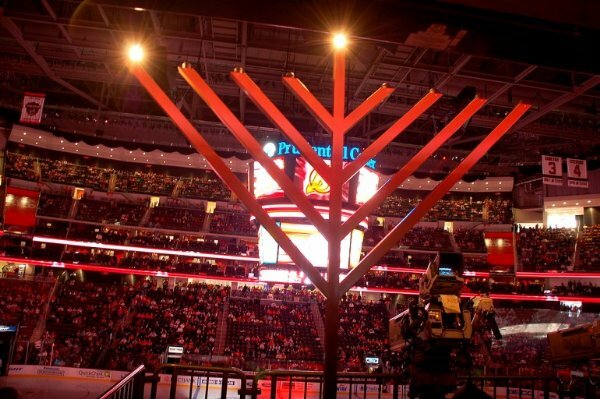 More than 20,000 participants celebrated Chanukah this year on the eve of Chanukah, Sunday, Dec. 21, at the new Prudential Arena in downtown Newark, N.J. As the hockey rivals, N.J. Devils played the Phildelphia Flyers a giant 10 foot tall Menorah was placed in the center stage of the Arena. After the second period, a video was shown to all participants. The video depicted a Chanukah Menorah being lit by people from all backgrounds to music of the famous tune, "Yes We Can". Following the video, the arena's lights were dimmed and the announcer requested every one's attention to the center of the arena. The spotlight shined on the beautiful Menorah, and the announcer read a brief inspirational and universal Chanukah Message. Then the "Hockey Maven", Mr. Stan Fischler, and Chabad Rabbi Yosef Carlebach were asked to light the first candle of the Menorah. The crowd cheered and roared as the Menorah was lit and Chanukah music blared. As this hockey game also attracted many Jewish families as "Jewish Family Night", hundreds of Chanukah Menorah Kits, featuring Menorahs, candles, dreidels, and holiday guides were distributed by the Devils management. In addition, three "Chanukah Mitzvah-Mobiles", (special mobile homes, decorated with electrical giant Menorahs), received special permits from the Newark Police Department to be parked outside, at the main entrances. Hundreds of fans were greeted by the Chabad Rabbis and volunteers, and received Chanukah Kits, and chocolate Chanukah gelt. Tens of fans also put on Tefillin during the daylight hours of the game. As the fans left the game - which was won by the Devils- over one thousand Menorahs were distributed in moments. Rabbi Yosef Carlebach, director of Chabad House at Rutgers University stated, "this was the largest Chanukah celebration in New Jersey history! Let us hope and pray that this celebration leads us speedily to the day that we re-kindle the Menorah of our Third Bait Hamikdash, with the coming of Moshiach, speedily in our days!"